"Plane crash" redirects here. For other uses, see Plane Crash (disambiguation). 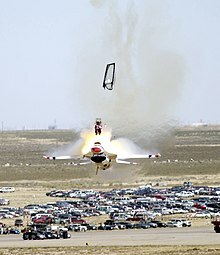 A USAF Thunderbirds pilot ejects from his General Dynamics F-16 Fighting Falcon less than a second before it hits the ground. In aviation, an accident is defined by the Convention on International Civil Aviation Annex 13 as an occurrence associated with the operation of an aircraft, which takes place from the time any person boards the aircraft with the intention of flight until all such persons have disembarked, and in which a) a person is fatally or seriously injured, b) the aircraft sustains significant damage or structural failure, or c) the aircraft goes missing or becomes completely inaccessible. Annex 13 defines an incident as an occurrence, other than an accident, associated with the operation of an aircraft that affects or could affect the safety of operation. A hull loss occurs if an aircraft is destroyed, damaged beyond repair, lost, or becomes completely inaccessible. The first fatal aviation accident was the crash of a Rozière balloon near Wimereux, France, on June 15, 1785, killing the balloon's inventor, Jean-François Pilâtre de Rozier, and the other occupant, Pierre Romain. The first involving a powered aircraft was the crash of a Wright Model A aircraft at Fort Myer, Virginia, in the United States on September 17, 1908, injuring its co-inventor and pilot, Orville Wright, and killing the passenger, Signal Corps Lieutenant Thomas Selfridge. 2,996: The deadliest aviation-related disaster of any kind, considering fatalities on both the aircraft and the ground, was the destruction of the World Trade Center in New York City on September 11, 2001. On that morning, four commercial aircraft traveling on transcontinental flights from East Coast airports to California were hijacked after takeoff. The four hijacked aircraft were subsequently crashed in four separate suicide attacks against major American landmarks, by 19 Islamic terrorists affiliated with Al Qaeda. American Airlines Flight 11 and United Airlines Flight 175 were intentionally crashed into the North and South Towers respectively of the World Trade Center, destroying both buildings in less than two hours. The World Trade Center crashes killed 2,753, the vast majority of fatalities being occupants of the World Trade Center towers or emergency personnel responding to the disaster. In addition, 184 were killed by American Airlines Flight 77, which crashed into The Pentagon (causing severe damage and partial destruction to the building's west side). 40 passengers were also killed when United Airlines Flight 93 crashed into a Somerset County Pennsylvania field after passengers fought back and prevented the hijackers from reaching their designated target. This brought the total number of casualties of the September 11 attacks to 2,996 (including the 19 terrorist hijackers). As deliberate terrorist acts, the 9/11 crashes were not classified as accidents, but as mass murder-suicide; these events were subsequently treated by the United States and the member nations of NATO as an act of war and terrorism. 583: The Tenerife airport disaster, which occurred on March 27, 1977, remains the accident with the highest number of airliner passenger fatalities. 583 people died when a KLM Boeing 747 attempted to take off without flight clearance, and collided with a taxiing Pan Am 747 at Los Rodeos Airport on the Canary Island of Tenerife, Spain. There were no survivors from the KLM aircraft and only 61 of the 396 passengers and crew on the Pan Am aircraft survived. Pilot error was the primary cause, as the KLM captain began his takeoff run without obtaining air traffic control clearance. A contributing factor was the dense fog. The KLM flight crew could not see the Pan Am aircraft on the runway until immediately before the collision. The accident had a lasting influence on the industry, particularly in the area of communication. An increased emphasis was placed on using standardized phraseology in air traffic control (ATC) communication by both controllers and pilots alike. "Cockpit Resource Management" has also been incorporated into flight crew training. The captain is no longer considered infallible, and combined crew input is encouraged during aircraft operations. 520: The crash of Japan Airlines Flight 123 on August 12, 1985, is the single-aircraft disaster with the highest number of fatalities: 520 people died on board a Boeing 747. The aircraft suffered an explosive decompression from an incorrectly repaired aft pressure bulkhead, which failed in mid flight, destroying most of its vertical stabilizer and severing all of the hydraulic lines, making the 747 virtually uncontrollable. Pilots were able to keep the plane flying for 32 minutes after the mechanical failure before crashing into a mountain. All 15 crew members and 505 of the 509 passengers on board died. Rescue operations were delayed until the following morning, which likely decreased the number of victims who would have survived the incident. Furthermore, Japanese personnel inaccurately assumed, during a helicopter flyover of the impact site, that there were no survivors. Medical providers involved in rescue and analysis operations determined that several passengers likely survived the impact and probably would have survived the incident had rescue operations not been delayed. Four passengers survived the incident in its entirety; meaning that they were alive when discharged from the hospital. 349: On November 12, 1996, the world's deadliest mid-air collision was the Charkhi Dadri mid-air collision involving Saudia Flight 763 and Kazakhstan Airlines Flight 1907 over Charkhi Dadri, India. The collision was mainly the result of the Kazakh pilot flying lower than the assigned clearance altitude. All 349 passengers and crew on board of both the aircraft died. The Ramesh Chandra Lahoti Commission, empowered to study the causes, recommended the creation of the "semi-circular rule", to prevent aircraft from flying in opposite directions at the same altitude. The Civil Aviation Authorities in India made it mandatory for all aircraft flying in and out of India to be equipped with a Traffic Collision Avoidance System (TCAS), setting a worldwide precedent for mandatory use of TCAS. 346: On March 3, 1974, Turkish Airlines Flight 981, a McDonnell Douglas DC-10, crashed in a forest northeast of Paris, France. The London-bound plane crashed shortly after taking off from Orly airport; all 346 people on board died. It was later determined that the cargo door detached, which caused an explosive decompression; this caused the floor just above to collapse. The collapsed floor severed the control cables, which left the pilots without control of the elevators, the rudder and No. 2 engine. The plane entered a steep dive and crashed. It was the deadliest plane crash of all time until the Tenerife disaster in 1977. It is currently the deadliest single-aircraft crash with no survivors. 329: On June 23, 1985, Air India Flight 182, a Boeing 747-237B, crashed off the southwest coast of Ireland when a bomb exploded in the cargo hold. All 307 passengers and 22 crew members died. One passenger had checked in as "M. Singh". Singh did not board the flight. His suitcase containing the bomb was loaded onto the plane, however. "Mr Singh" was never identified or captured. It was later determined Sikh extremists were behind the bombing as a retaliation for the Indian government's attack on the Golden Temple in the city of Amritsar, which is very important for the Sikhs. This was, at the time, the deadliest terrorist attack involving an airplane. 301: On August 19, 1980, Saudi Arabian Airlines Flight 163, a Lockheed L-1011, became the world's deadliest aviation accident that did not involve a crash. The crew performed an emergency landing at Riyadh after a fire broke out in an aft baggage compartment. The fire burned through the ceiling of the compartment and into the passenger cabin. While the crew managed to land the plane safely, the captain did not stop immediately and order an evacuation. He taxied off the runway instead, by which time everyone in the cabin had become unconscious due to fumes and unable to open any doors or evacuate. All 301 passengers and crew died of suffocation before rescue ground crews could open any door, after which the aircraft burst into flames and was consumed by fire. 298: On July 17, 2014, Malaysia Airlines Flight 17, a Boeing 777-200ER, flying from Amsterdam to Kuala Lumpur with 298 people on board, was shot down in an area of Eastern Ukraine near the Ukraine/Russian border during the Donbass armed conflict. There were 283 passengers, including 3 infants, and 15 crew members on board MH17, all of whom perished. The crew were all Malaysians, while the passengers were of various nationalities, most from the Netherlands. According to a Dutch report, high-energy objects hit the plane in midair, causing it to break apart. According to the preliminary report of the international investigation commission, the plane was allegedly shot down by Ukrainian separatists using a surface-to-air missile fired from the Ukrainian territory that they occupied. This was the deadliest incident involving a Boeing 777. 290: On July 3, 1988, Iran Air Flight 655, an Iranian Airbus A300-200 airliner, was shot down by two surface-to-air missiles from the U.S. Navy guided missile cruiser USS Vincennes over the Strait of Hormuz. All 290 passengers and crew aboard the aircraft died. 275: On February 19, 2003, an Iranian military Ilyushin Il-76 crashed in mountainous terrain near Kerman in Iran. The official report says bad weather brought the aircraft down; high winds and fog were present at the time of the crash. 273: On May 25, 1979, American Airlines Flight 191, a McDonnell Douglas DC-10-10, crashed shortly after lifting off the runway at Chicago O'Hare Airport after the number one (left) engine and pylon separated from the wing. This broke hydraulic lines, causing leading edge lift devices to retract on that side of the aircraft and resulted in asymmetrical lift and loss of control. The accident was attributed to improper maintenance procedures. The crash resulted in the deaths of all 271 passengers and crew on board, as well as two people on the ground. It remains the deadliest commercial aircraft accident in United States history, and was also the country's deadliest aviation disaster until the September 11 attacks in 2001. 270: On December 21, 1988, Pan Am Flight 103, a Boeing 747–121 bound for New York–JFK from London–Heathrow with continued service to Detroit, was destroyed by a terrorist bomb over the town of Lockerbie, Scotland. All 243 passengers and 16 crew, and 11 people on the ground (all residents of Sherwood Crescent, Lockerbie), died, making it the worst terrorist attack involving an aircraft in the UK and the deadliest terrorist attack on British soil. Following the crash, the Federal Aviation Administration imposed new security measures on American airlines flying out of 103 airports in Western Europe and the Middle East. 269: On September 1, 1983, a Soviet interceptor Sukhoi Su-15 shot down Korean Air Lines Flight 007, a Boeing 747-230B, bound for Gimpo International Airport in Seoul, South Korea, after it flew into Soviet airspace; all 269 passengers and crew on board died. 265: On November 12, 2001, American Airlines Flight 587, an Airbus A300, crashed in the Belle Harbor neighborhood of Queens, New York, just after departing John F. Kennedy International Airport bound for Las Américas International Airport, Santo Domingo. The first officer's overuse of the rudder in response to wake turbulence from a Japan Airlines 747 was cited as cause. All 260 people on board, as well as five people on the ground, died from the crash. It is the second-deadliest aviation accident on U.S. soil, after American Airlines Flight 191. 264: On April 26, 1994, China Airlines Flight 140 was completing a routine flight and approach at Nagoya Airport, Japan, when the Airbus A300B4-622R's First Officer inadvertently pressed the Takeoff/Go-around button, which raises the throttle position to the same as take offs and go-arounds. The action and the two pilots' reaction resulted in a crash that killed 264 (15 crew and 249 passengers) of the 271 people aboard. 261: On July 11, 1991, Nigeria Airways Flight 2120, a Douglas DC-8-61 aircraft operated by Nationair Canada, crashed in Jeddah, Saudi Arabia, after two tires ignited upon takeoff, leading to an in-flight fire. All 247 passengers and 14 crew members were killed. It is the deadliest aviation accident involving a DC-8, the largest aviation disaster involving a Canadian-registered aircraft and the second-worst accident in Saudi Arabia. 257: On April 11, 2018, an Algerian Air Force Il-76 transport plane crashed shortly after take-off from Boufarik Airport, killing all 247 passengers and 10 crew on board. 257: On November 28, 1979, Air New Zealand Flight 901, an Antarctic sightseeing flight, collided with Mount Erebus on Ross Island, Antarctica, killing all 237 passengers and 20 crew on board. The flight crew had not been informed that the computer coordinates for the flight path of the McDonnell Douglas DC-10-30 had been changed the night before, directing the flight directly into Mount Erebus rather than the usual path down McMurdo Sound. 256: On December 12, 1985, a Douglas DC-8, Arrow Air Flight 1285, carrying American military personnel on a charter flight home for Christmas, crashed in Newfoundland; all 248 passengers and 8 crew members died. The Canadian Aviation Safety Board investigating the cause of the crash issued two different reports: the majority report cited ice on the wings as cause of the crash; the minority report suggests an explosion was the likely cause. 239: On March 8, 2014, a Boeing 777-200ER, Malaysia Airlines Flight 370, flying from Kuala Lumpur, Malaysia, to Beijing, China, lost contact with air traffic controllers over the South China Sea, deviated from its planned route, and was presumed lost in the southern Indian Ocean. It carried 12 Malaysian crew members and 227 passengers from 15 nations. A multinational search effort, the most extensive and expensive in aviation history, has thus far failed to locate them, though debris from the aircraft were recovered on July 29, 2015, on Réunion Island. Numerous theories have been offered to explain the disappearance of the flight, but none has been confirmed. 234: On September 26, 1997, an Airbus A300B4-220, Garuda Indonesia Flight 152, which departed from Jakarta, Indonesia, and was preparing to land at Medan, North Sumatra, crashed into mountainous terrain, killing 222 passengers and 12 crew members. The causes included turning left instead of right as instructed by the ATC and descending below the assigned altitude of 2,000 feet due to pilot error. 230: On July 17, 1996, a Boeing 747-131, TWA Flight 800, carrying 212 passengers and 18 crew, exploded and crashed into the Atlantic Ocean near East Moriches, New York, shortly after departing from John F. Kennedy International Airport on a flight to Paris and Rome. A lengthy investigation concluded that the probable cause of the accident was a short circuit in a fuel tank that contained an explosive mixture of fuel vapor and air. As a result, new requirements were developed to prevent future fuel tank explosions in aircraft. 229: On September 2, 1998, a McDonnell Douglas MD-11, Swissair Flight 111, carrying 215 passengers and 14 crew from New York City to Geneva, Switzerland crashed into the Atlantic Ocean near Halifax, Nova Scotia, Canada, killing all aboard. After a lengthy investigation, an official report stated that flammable material used in the aircraft's structure, specifically the Personal TV Systems recently installed in the Business Class Cabin, allowed a fire to spread, resulting in a loss of control. 228: On June 1, 2009, an Airbus A330-203, Air France Flight 447, carrying 216 passengers and 12 crew, was en route from Rio de Janeiro, Brazil to Paris, France, when it crashed into the Atlantic Ocean. The aircraft's flight recorders were not recovered from the ocean floor until May 2011, and the final investigative report was released in July 2012. It determined that the disaster was likely due to the aircraft's pitot tubes being obstructed by ice crystals, causing the autopilot to disconnect. The crew reacted incorrectly, leading to an aerodynamic stall from which the jet did not recover. 228: On August 6, 1997, a Boeing 747-3B5, Korean Air Flight 801, crashed on approach to the international airport in the United States territory of Guam, killing 228 of the 254 people aboard. Contributing factors in the crash were fatigue and errors by the flight crew, inadequate flight crew training, and a modification of the airport's altitude warning system that prevented it from detecting aircraft below a minimum safe altitude. 227: On January 8, 1996, an Antonov An-32B aircraft with 6 crew members on board overshot the runway at N'Dolo Airport and plowed into a market place. Four on board survived but 225 people on the ground were killed and an estimated 500 were injured (estimated 253 seriously injured). It is the crash with the most non-passenger ground fatalities (not including 9/11). It is usually known as the 1996 Air Africa crash. 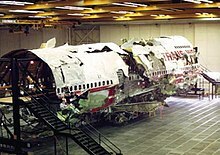 225: On May 25, 2002, a Boeing 747-209B, China Airlines Flight 611, bound for Hong Kong International Airport in Hong Kong, disintegrated in mid-air and crashed into the Taiwan Strait 20 minutes after takeoff from Chiang Kai-shek International Airport (now Taiwan Taoyuan International Airport) in Taiwan. It was determined that the crash, which killed all 206 passengers and 19 crewmembers aboard the plane, was caused by improper repairs to the aircraft 22 years earlier when the aircraft encountered a tailstrike. 224: On October 31, 2015, an Airbus A321-231, Metrojet Flight 9268, crashed in the Sinai Peninsula after departing Sharm el-Sheikh International Airport, Egypt, en route to Pulkovo Airport, Saint Petersburg, Russia. All 217 passengers and 7 crewmembers were killed. A branch of the Islamic State of Iraq and the Levant claimed responsibility for bringing down the jet, and a Russian investigation concluded that a bomb was detonated inside the plane at a high altitude. 223: On May 26, 1991, a Boeing 767-3Z9ER, Lauda Air Flight 004, broke up in midair over a remote area of Thailand due to an uncommanded deployment of a thrust reverser on one of the plane's engines, killing all 213 passengers and 10 crewmembers aboard. The flight, which originated at Kai Tak Airport, Hong Kong, and made a stopover at Don Mueang International Airport in Bangkok, Thailand, was en route to Vienna International Airport, Vienna, Austria, when the accident occurred. 217: On October 31, 1999, a Boeing 767-366ER, EgyptAir Flight 990, flying from Los Angeles International Airport, United States, to Cairo International Airport, Egypt, with a stop at John F. Kennedy International Airport, New York City, crashed into the Atlantic Ocean south of Nantucket Island, Massachusetts, killing all 203 passengers and 14 crewmembers. The National Transportation Safety Board determined that the probable cause of the crash was deliberate action by the relief first officer in response to his removal from international service within Egyptair, a finding disputed by Egyptian authorities who maintain another cause of the accident. 213: On January 1, 1978, a Boeing 747-237B, Air India Flight 855, crashed into the Arabian Sea just off the coast of Bombay, India, killing all 190 passengers and 23 crew on board. An investigation concluded that the captain became disoriented after the failure of one of the flight instruments in the cockpit, leading to "irrational control inputs" that caused the plane to crash. 203: On February 16, 1998, an Airbus A300B4-622R, China Airlines Flight 676, en route from Ngurah Rai Airport in Bali, Indonesia, to Chiang Kai-shek International Airport (now Taoyuan International Airport), Taiwan, crashed into a road and residential neighborhood in Taoyuan, Taiwan, killing 182 passengers, 14 crew, and 7 people on the ground. An investigation determined that when the control tower ordered the pilot to abort his landing and "go around" for a second attempt, the pilot, who had unintentionally released the plane's autopilot, did nothing to take control of the plane for 11 seconds as he apparently thought the autopilot would initiate the go around. As the aircraft approached the airport, the pilot executed a sudden steep ascent that produced a stall and crash. China Airlines was also criticized for "insufficient training." 200: On July 10, 1985, a Tupolev Tu-154B-2, Aeroflot Flight 7425, on a domestic Karshi–Ufa–Leningrad route, crashed near Uchkuduk, Uzbek SSR, Soviet Union, on the second leg of its route. All 191 passengers and 9 crew were killed. An investigation concluded that the plane went down due to pilot error. The air crew used an inappropriately low airspeed, causing vibrations that they incorrectly interpreted as engine surges. As a result, they further reduced engine power, causing the aircraft to stall and crash. Controlled Impact Demonstration by NASA and the FAA. Measured on a passenger-distance calculation, air travel is the safest form of transportation available: Figures mentioned are the ones shared by the air industry when quoting air safety statistics. A typical statement, e.g., by the BBC: "UK airline operations are among the safest anywhere. When compared to all other modes of transport, on a 'fatality per mile basis', air transport is the safest — six times safer than traveling by car; twice as safe as rail." When measured by fatalities per person transported, however, buses are the safest form of transportation. The number of air travel fatalities per person is surpassed only by bicycles and motorcycles. This statistic is used by the insurance industry when calculating insurance rates for air travel. Per every billion kilometers traveled, trains have a fatality rate 12 times over air travel; by comparison, fatality rates for automobiles are 62 times greater than air travel. By contrast, for every billion journeys, buses are the safest form of transportation. By the last measure, air transportation is three times more dangerous than car transportation, and almost 30 times more dangerous than bus. After the crash of Gol Transportes Aéreos Flight 1907, Brazilian Air Force personnel recover the flight data recorder of the flight. A 2007 study by Popular Mechanics found passengers sitting at the back of a plane are 40% more likely to survive a crash than those sitting in the front. Although this article quotes Boeing, the FAA and a website on aircraft safety, all claim there is no "safest" seat. The article studied 20 crashes, not taking into account the developments in safety after those accidents. A flight data recorder is usually mounted in the aircraft's empennage (tail section), however, where it is more likely to survive a severe crash. Over 95% of people in U.S. plane crashes, between 1983 and 2000, survived. In efforts to prevent incidents such as the disappearance of Malaysia Airlines Flight MH370, a new standard has been issued for all commercial aircraft to report their position every 15 minutes to air traffic controllers regardless of the country of origin. The regulation was taken into effect in 2016 by the ICAO, and requires no new aircraft equipment so long as airlines adhere to it. This requirement is part of a long-term plan, in which by 2020 ICAO will require new aircraft be fitted with data broadcast systems that air traffic controllers are in constant contact with. The plan is called the Global Aeronautical Distress and Safety System. The Aviation Safety Reporting System (ASRS) collects voluntarily submitted aviation safety incident/situation reports from pilots, controllers and others. The ASRS uses reports to identify system deficiencies, issue alert messages, and produce two publications, CALLBACK, and ASRS Directline. The collected information is made available to the public, and is used by the FAA, NASA and other organizations working in research and flight safety. The Bureau of Aircraft Accidents Archives (B3A), a non-government organization based in Geneva, compiles statistics on aviation accidents of aircraft capable of carrying more than six passengers, excluding helicopters, balloons, and combat aircraft. 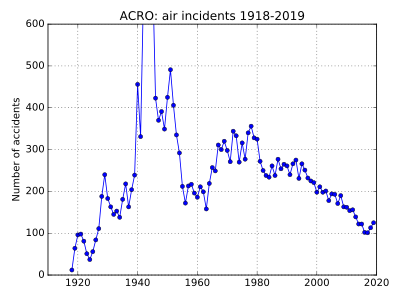 Note that ACRO only considers crashes in which the aircraft has suffered such damage that it is removed from service, which will further reduce the statistics for incidents and fatalities compared to some other data. 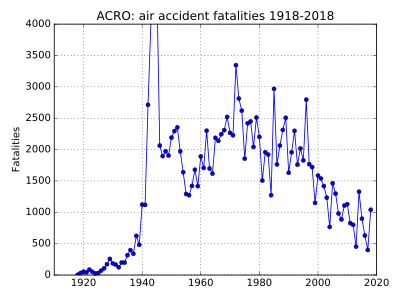 According to ACRO, recent years have been considerably safer for aviation, with fewer than 170 incidents every year between 2009 and 2017, compared to as many as 226 as recently as 1998. Annual fatalities have been less than 1,000 in nine of the fourteen years since 2004, with 2017 experiencing the lowest number of fatalities, at 399, since the end of World War II. 2014 included the disappearance of flight MH370 over the Indian Ocean and the shootdown of flight MH17 by pro-Russian separatists in Ukraine as part of the War in Donbass. The total number of fatalities in 2014 was 869 more than in 2013. The European Aviation Safety Agency (EASA) is tasked by Article 15(4) of Regulation (EC) No 216/2008 of the European Parliament and of the Council of February 20, 2008 to provide an annual review of aviation safety. The Annual Safety Review presents statistics on European and worldwide civil aviation safety. Statistics are grouped according to type of operation, for instance, commercial air transport, and aircraft category, such as aeroplanes, helicopters, gliders, etc. The Agency has access to accident and statistical information collected by the International Civil Aviation Organization (ICAO). States are required, according to ICAO Annex 13, on Aircraft Accident and Incident Investigation, to report to ICAO information, on accidents and serious incidents to aircraft with a maximum certificated take-off mass (MTOM) over 2250 kg. Therefore, most statistics in this review concern aircraft above this mass. In addition to the ICAO data, a request was made to the EASA Member States to obtain light aircraft accident data. Furthermore, data on the operation of aircraft for commercial air transport were obtained from both ICAO and the NLR Air Transport Safety Institute. See also: Category:Organizations investigating aviation accidents and incidents. Annex 13 of the Chicago Convention provides the international Standards And Recommended Practices that form the basis for air accident and incident investigations by signatory countries, as well as reporting and preventative measures. The International Civil Aviation Organization (ICAO) is specifically focused on preventing accidents, rather than determining liability. In Australia, the Australian Transport Safety Bureau is the federal government body responsible for investigating transport-related accidents and incidents, covering air, sea, and rail travel. Formerly an agency of the Department of Infrastructure, Transport, Regional Development and Local Government, in 2010, in the interests of keeping its independence it became a stand-alone agency. In Brazil, the Aeronautical Accidents Investigation and Prevention Center (CENIPA) was established under the auspices of the Aeronautical Accident Investigation and Prevention Center, a Military Organization of the Brazilian Air Force (FAB). The organization is responsible for the activities of aircraft accident prevention, and investigation of civil and military aviation occurrences. Formed in 1971, and in accordance with international standards, CENIPA represented a new philosophy: investigations are conducted with the sole purpose of promoting the "prevention of aeronautical accidents". In France, the agency responsible for investigation of civilian air crashes is the Bureau d'Enquêtes et d'Analyses pour la Sécurité de l'Aviation Civile (BEA). Its purpose is to establish the circumstances and causes of the accident and to make recommendations for their future avoidance. In Germany, the agency for investigating air crashes is the Federal Bureau of Aircraft Accidents Investigation (BFU). It is an agency of the Federal Ministry of Transport and Digital Infrastructure. The focus of the BFU is to improve safety by determining the causes of accidents and serious incidents and making safety recommendations to prevent recurrence. In Hong Kong, the Civil Aviation Department's Flight Standards & Airworthiness Division and Accident Investigation Division are charged with accident investigation involving aircraft within Hong Kong. Until May 30, 2012, the Directorate General of Civil Aviation investigated incidents involving aircraft. Since then, the Aircraft Accident Investigation Bureau has taken over investigation responsibilities. In Indonesia, the National Transportation Safety Committee (NTSC; Indonesian: Komite Nasional Keselamatan Transportasi, KNKT; literally translated the Transportation Safety National Committee) is responsible for the investigation of incidents and accidents, including air accidents. Its aim is the improvement of transportation safety, not just aviation, in Indonesia. Created in 1999 in Italy, the Agenzia Nazionale per la Sicurezza del Volo (ANSV), has two main tasks: conducting technical investigations for civil aviation aircraft accidents and incidents, while issuing safety recommendations as appropriate; and conducting studies and surveys aimed at increasing flight safety. The organization is also responsible for establishing and maintaining the "voluntary reporting system." Although not under the supervision of the Ministry of Infrastructure and Transport, the ANSV is a public authority under the oversight of the Presidency of the Council of Ministers of Italy. The Japan Transport Safety Board investigates aviation accidents and incidents. The Aircraft Accident Investigation Commission investigated aviation accidents and incidents in Japan until October 1, 2001, when the Aircraft and Railway Accidents Investigation Commission (ARAIC) replaced it, and the ARAIC did this function until October 1, 2008, when it merged into the JTSB. In Mexico the Directorate General of Civil Aviation (DGAC) investigates aviation accidents. In the Netherlands, the Dutch Safety Board (Onderzoeksraad voor Veiligheid) is responsible for the investigation of incidents and accidents, including air accidents. Its aim is the improvement of safety in the Netherlands. Its main focus is on those situations in which civilians are dependent on the government, companies or organizations for their safety. The Board solely investigates when incidents or accidents occur and aims to draw lessons from the results of these investigations. The Safety Board is objective, impartial and independent in its judgment. The Board will always be critical towards all parties concerned. In Russia, the Interstate Aviation Committee (IAC, MAK according to the original Russian name) is an executive body overseeing the use and management of civil aviation in the Commonwealth of Independent States. This organization investigates air accidents in the former USSR area under the umbrella of the Air Accident Investigation Commission of the Interstate Aviation Committee. In Taiwan, the Aviation Safety Council (ASC) is the independent government agency that is responsible for aviation accident investigations. Established in 1998, ASC is under the administration of the Executive Yuan and independent from Civil Aeronautics Administration of Taiwan. The ASC consisted of five to seven board members, including a chairman and a vice chairman, appointed by the Premier. The managing director of ASC manages the day-to-day function of the organization, including accident investigations. United States civil aviation incidents are investigated by the National Transportation Safety Board (NTSB). NTSB officials piece together evidence from the crash site to determine likely cause, or causes. The NTSB also investigates overseas incidents involving US-registered aircraft, in collaboration with local investigative authorities, especially when there is significant loss of American lives, or when the involved aircraft is American built. It is common for an airline to cease using the flight number of a fatal crash, although that is not always the case. ^ Does not include victims of the September 11 attacks outside the planes. There were 2740 fatalities outside the planes, which would bring the total to 4279 if counted. ^ a b "Annex 13 to the Convention on International Civil Aviation". The Investigation Process Research Resource Site. October 11, 1994. Chapter I, Definitions. Retrieved July 20, 2018. ^ "Definitions of Key Terms: Industry Definitions". AirSafe.com. July 2, 2017. Retrieved July 20, 2018. ^ Flammarion, Camille (writing as Fulgence Marion) (1870). "The Necrology of Aeronautics". Wonderful Balloon Ascents; or, The Conquest of the Skies. Cassell, Peter & Galpin. pp. 181–86. Retrieved July 20, 2018. Translated from the original French by the publisher. ^ "A Visual Timeline of What Inspired the Wright Brothers – First Fatal Airplane Crash in 1908". thoughtco.com. Retrieved July 6, 2017. ^ a b Tonyleather. "The Deadliest Airplane Accidents in History". Retrieved May 7, 2012. ^ Sebastien Freissinet. "The Tenerife crash-March 27th, 1977". Retrieved May 7, 2012. ^ "ASN Accident Description". Aviation Safety Network. ^ "The Tenerife Airport Disaster – the worst in aviation history". The Tenerife Information Centre. Retrieved October 29, 2014. ^ "Aircraft Accident Investigation Report Japan Air Lines Co., Ltd. Boeing 747 SR-100, JA8119 Gunma Prefecture, Japan August 12, 1985" (PDF). Japan Transport Safety Board. June 19, 1987. Retrieved July 7, 2017. ^ AviationSafetyNetwork. "Accident description". Retrieved May 7, 2012. ^ a b "Aircraft Accident Investigation Report Japan Air Lines Co., Ltd. Boeing 747 SR-100, JA8119 Gunma Prefecture, Japan August 12, 1985." 22 (33/332). Retrieved August 18, 2010. ^ Klein. "Top 10 plane crashes in the world". Retrieved June 11, 2013. ^ "Semicircular Cruising Level System (ICAO)". Flight Crew Guide. Retrieved January 10, 2017. ^ "Accident description". Aviation Safety Network. Retrieved November 19, 2014. ^ Touchton. "Recent Major Bomb Blasts and Terror Attacks in India". Archived from the original on July 15, 2014. Retrieved May 7, 2012. ^ "Saudi Arabian Airlines flight 163 Accident Report" (PDF). Saudi Arabian Presidency of Civil Aviation. Archived from the original (PDF) on December 31, 2013. Retrieved October 31, 2016. ^ Wall, Robert; Pasztor, Andy. "Malaysia Airlines Flight 17 Hit by High-Energy Objects, Says Dutch Report". The Wall Street Journal. Retrieved September 26, 2014. ^ Kilroy. "Special Report: American Airlines Flight 191". Archived from the original on July 21, 2006. Retrieved May 7, 2012. ^ David Young. "The crash of American Airlines Flight 191 near O'Hare". Chicago Tribune. Retrieved May 7, 2012. ^ The Washington Post Company (May 19, 1999). "The Bombing of Pan Am Flight 103". Retrieved May 7, 2012. ^ The Learning Network (December 21, 2011). "December 21, 1988: Pan Am Flight 103 Crashes Over Lockerbie, Scotland". The New York Times. Retrieved March 22, 2014. ^ The Washington Post Company (September 8, 1998). "Security Rukes Tightened for U.S. Airlines Abroad". Retrieved May 7, 2012. ^ "1983: Korean airliner 'shot down'". BBC News. September 1, 1983. Retrieved June 1, 2009. ^ "In-Flight Separation of Vertical Stabilizer American Airlines Flight 587 Airbus Industrie A300-605R, N14053 Belle Harbor, New York November 12, 2001 Aircraft Accident Report NTSB/AAR-04/04" (PDF). NTSB. October 26, 2004. Retrieved July 6, 2017. ^ AirSafe.com. "Investigation of the Crash of American Airlines Flight 587". Retrieved May 7, 2012. ^ "Accident description N14053". Aviation Safety Network. Retrieved July 6, 2017. ^ "Nagoya A300 Accident Report". Sunnyday.mit.edu. Retrieved April 26, 2013. ^ "Anniversary of Nationair plane crash passes quietly". The Canadian Press. Retrieved August 28, 2014. ^ "Aircraft accident : Ilyushin Il-76TD 7T-WIP * Boufarik Airport". Aviation Safety Network. Flight Safety Foundation. ^ Accident description for ZK-NZP at the Aviation Safety Network. Retrieved on August 24, 2011. ^ "DC-10 playbacks awaited". Flight International: 1987. December 15, 1979. Archived from the original on January 24, 2013. At press time no information had been released concerning the flightdata and cockpit-voice recorder of Air New Zealand McDonnell Douglas DC-10 ZK-NZP, which crashed on Mount Erebus on 28 November. ^ "Air NZ apologises for Mt Erebus crash". The Age. Wellington. October 24, 2009. Retrieved February 17, 2017. ^ "Accident description N950JW". Aviation Safety Network. Retrieved July 6, 2017. ^ "How Things Work: Evacuation Slides". Air & Space Smithsonian. Retrieved May 9, 2012. ^ "How Airplanes Work". how stuffworks?. Retrieved May 9, 2012. ^ "Flying remains the safest form of travel". BBC News. May 8, 2000. Retrieved January 1, 2010. ^ "Flight into danger". New Scientist Space. August 7, 1999. ^ "The risks of travel". numberwatch.co.uk. Archived from the original on September 7, 2001. Retrieved February 17, 2017. The website attributes the source as an October 2000 article by editor Roger Ford in the magazine Modern Railways and based on an unidentified DETR survey. ^ David Noland (July 18, 2007). "Safest Seat on a Plane: PM Investigates How to Survive a Crash". Popular Mechanics. Archived from the original on September 12, 2007. ^ Watt, Nick (January 17, 2007). "Staying Alive During a Plane Crash". ABC News. Retrieved February 17, 2017. ^ "Airline Safety". CQ Researcher by CQ Press. Retrieved March 16, 2016. ^ "Aviation Safety Reporting System". ASRS. May 9, 2012. ^ "My mission, my goal". Bureau of Aircraft Accidents Archives, Aircraft Crashes Record Office (ACRO). Archived from the original on October 25, 2016. Retrieved February 17, 2017. ^ "B3A Accidents per year". Retrieved January 1, 2018. ^ B3A. "B3A Deaths Per Year". Retrieved January 1, 2018. ^ "Death Rate per Year". Bureau of Aircraft Accidents Archives (ACRO). Archived from the original on July 12, 2017. Retrieved November 24, 2017. ^ "Crashs Rate per Year". Bureau of Aircraft Accidents Archives (ACRO). Archived from the original on July 28, 2017. Retrieved November 24, 2017. ^ "Liste des deces par annee". Bureau of Aircraft Accidents Archives (ACRO). Archived from the original on November 4, 2015. Death rate page as it appeared on 4 November 2015. ^ "Liste du nombre d'accidents par annee". Bureau of Aircraft Accidents Archives (ACRO). Archived from the original on November 4, 2015. Crash rate page as it appeared on 4 November 2015. ^ "European Aviation Safety Agency". EASA. July 6, 2017. ^ NLR-ATSI. "NLR-ATSI". Archived from the original on March 8, 2007. Retrieved October 29, 2014. ^ "Annex 13 to the Convention on International Civil Aviation: Aircraft Accident and Incident Investigation" (PDF). ICAO. Archived from the original (PDF) on May 22, 2013. Retrieved January 9, 2012. ^ "Australian Transport Safety Bureau". Australian Government. Retrieved May 9, 2012. ^ "Welcome to the TSB". Transportation Safety Board of Canada. Retrieved May 9, 2012. ^ "BEA". BEA. Archived from the original on June 27, 2013. Retrieved May 9, 2012. ^ a b "BFU Bundesstelle für Flugunfalluntersuchung BFU". German Federal Bureau of Aircraft Accident Investigation. Retrieved December 31, 2017. ^ "Hong Kong Civil Aviation Department – Introduction to our divisions". Retrieved July 6, 2017. ^ "Hong Kong Civil Aviation Department – Accident Investigation Division". Archived from the original on July 24, 2017. Retrieved July 6, 2017. ^ "Aircraft Accident Investigation Bureau India" (PDF). Aircraft Accident Investigation Bureau (India). May 4, 2017. Archived from the original (PDF) on March 15, 2014. Retrieved July 6, 2017. ^ "Chi siamo." Agenzia Nazionale per la Sicurezza del Volo. Retrieved on April 6, 2014. "Per garantire la suddetta posizione di terzietà, l’ANSV è stata posta sotto la vigilanza della Presidenza del Consiglio dei Ministri. Si tratta quindi dell’unica istituzione aeronautica che non è sottoposta vigilanza del Ministero delle infrastrutture e dei trasporti." ^ "Establishment of the JTSB." (Archive) Japan Transport Safety Board. Retrieved on March 24, 2009. ^ ICAO (July 2018). "Accident Investigation Authorities Addresses". ICAO Safety. Retrieved August 1, 2018. ^ "Dutch Safety Board". Retrieved May 27, 2015. ^ "Transport Accident Investigation Commission". TAIC. Retrieved May 9, 2012. ^ "Te Komihana Tirotiro Aitua Waka Transport Accident Investigation Commission Statement of Intent 2011 – 2014". Archived from the original on April 12, 2017. Retrieved July 12, 2017. ^ "Aviation Safety Council (Taiwan)". Retrieved February 6, 2015. ^ "AAIB". AAIB. Retrieved May 9, 2012. ^ "History of the National Transportation Safety Board". NTSB. Retrieved July 6, 2017. KLu Crash Archief; Ongevallenfoto's 1945 – 1965, 'Flash Aviation', 2003. KLu Crash Archief 2; Ongevallenfoto's 1964 – 1974, 'Flash Aviation', 2004. BLu Crash Archief; Ongevallenfoto's 1945 – 1965, 'Flash Aviation', 2004. Bordoni, Antonio. Airlife's Register Of Aircraft Accidents: Facts, Statistics and Analysis of Civil Accidents since 1951. Shrewsbury: Airlife, 1997 ISBN 1853109029 401p. S A Cullen MD FRCPath FRAeS. "Injuries in Fatal Aircraft Accidents" (Archive). NATO. Wikimedia Commons has media related to Aircraft accidents.